The Synagogue Church of All Nation in Ikotun, Lagos. 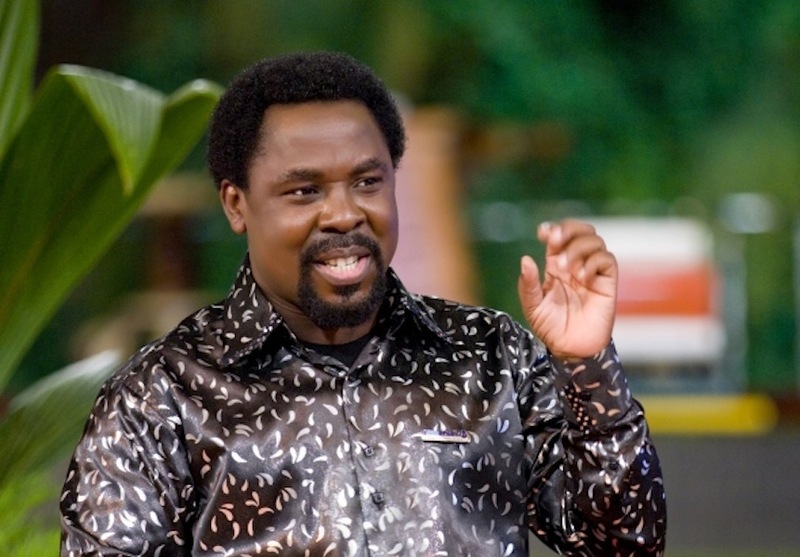 THE Synagogue Church of All Nations in Ikotun, Lagos, founded and shepherded by Prophet Temitope Balogun Joshua, truly lives to its billing as a church for all nationalities under the sun, and its architecture masterpiece tells a different story about Nigeria. Here, at the Synagogue city, beginning from the long tarred road lined on both sides by flowers, is beauty come to life. For a first time visitor, who is cleared to access the hallowed auditorium, the welcome becomes cordial and everyone greets you with ‘Emmanuel’ (God with us). The large splendid church of 140 by 70 metres often called cathedral has been built with the church’s people and resources and it’s being expanded daily. The emerging Synagogue city is a beautiful fancy to behold. There is a place for 20,000 people and they have almost 30,000 members. There is also a shop where you can buy ‘everything’. Beside the church is a large area with open tents where education is given to the young and the old, who are full time workers in the church and it is a mixed body of Nigerians and expatriates. When not receiving instruction, they carry out their assignments conscientiously, singing to themselves. At the other side of the road is a large area with many workshops: garage, metal and wood working. Beside it, are a large kitchen and a bread bakery. There is a little parking space for buses, which bring down members from all parts of Lagos. A walk along the church shows how nicely it is finished. On the church walls are beautiful murals of the last supper and Jesus in conversation with Nicodemus. It is not for anything that world leaders, African heads of government and notable personalities have had course in recent past to visit the church, particularly the man in the Synagogue. During an encounter with The Guardian last year, he said the source of attraction to the church is a simple answer: “It is because their needs are met. “People will always be attracted to wherever their needs will be met and the needs of men vary. What I want and like might be different from what you want; but it is not in my power, it is God, who is answering the needs of His people. “Even in the Bible, people travel far and wide to where their needs will be met. Also, the work of God is like honey. Wherever honey is, insects seek and find it. When God is doing a new thing in a place, people are attracted there. So, these presidents and other foreign nationals come to the church, because of what God is doing here,” he said. Just recently, the land flanking the church on the eastside, which once housed a petrol station and residential buildings, were acquired and construction has already begun to annex it to the church’s auditorium. BUT beyond the frontiers of the church is were the scenic sights ends. In seconds, you are transported from fantasyland to the grim reality of a Lagos ghetto, replete with its trademark shanties and bad roads. That community, known as Onilewura, is the other side of the Synagogue city. Onilewura is partly an industrial area, but mostly residential. It comprises seven streets namely Sadiq Estate, Leona Ajayi Close, Akerekoro Close, Ise Oluwa Street, Orija Street, Onilewura Street and the entrance into the community, which houses the Synagogue church, Segun Irefin Street. There are a host of companies and warehouses, prominent among which are Albert Company, JMG Generators, IPI and Olam, an agro-allied firm. A noticeable impact of the church’s presence in the area is the clusters of hotels and guesthouses, ranging between one star dormitory to five star lodges. There are over 50 in the area. Residents are, however, resentful that not a trace of the good life at the synagogue city is filtering into the community. As neighbours, they only see the beautiful life on television, while every Sunday, members of the church are ‘oppressed’ by the exotic cars that line their streets and give undue pressure to the roads already in urgent need of rehabilitation. 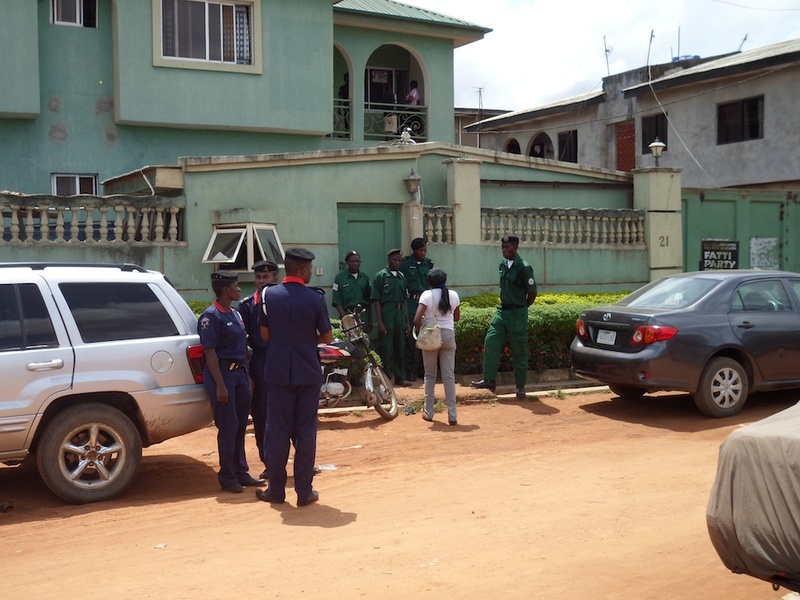 The voices of the embittered residents were echoed by the chairman of Onilewura Landlords and Residents Association, Mr. Olusola Adisa Oseni, when The Guardian visited the area last week. According to him, the church’s fame has only brought pain to the community. “On Saturdays and Sundays, it is a no-go area for everybody, the whole community is turned into a garage with transporters and car owners crowding out residents in every available space and the church is not doing anything about it. “The community has succeeded in having an audience with the founder only once in the last three years. Unfortunately, he doesn’t allow his members to park around the vicinity of the church. They don’t have a parking space despite the fact that he has been acquiring properties around the church. He is content allowing his members to litter the whole community with cars, while the church keeps its serenity even on worship days. After countless letters sent to Joshua by the community explaining their plight, he eventually gave community leaders audience in November 2011, where he promised to do something about the roads. In the mood of the season, which was close to Yuletide, the promised Onilewura residents bags of rice and two cows. Nearly 18 months after, the residents are still awaiting the promised Christmas package. 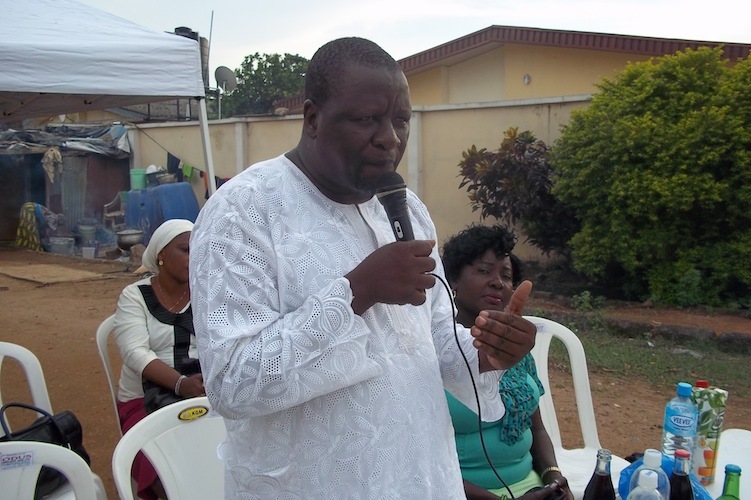 “We were happy when he told us that after doing so much for outsiders, he is now ready to extend his hand of fellowship to the community since we are his immediate neighbours and in the past, he used to walk across the road on foot. He also said to make us happy during Christmas, he would give us two cows and bags of rice to share. Sadly, we haven’t seen a grain of rice since then. “And because of the general attitude of the church to the community, companies and factories in the area have also been nonchalant about giving back and being socially responsible. The other option is to look up to government and that is a dead-end, because the local government is only interested in harassing citizens to pay council rates,” Oseni said. 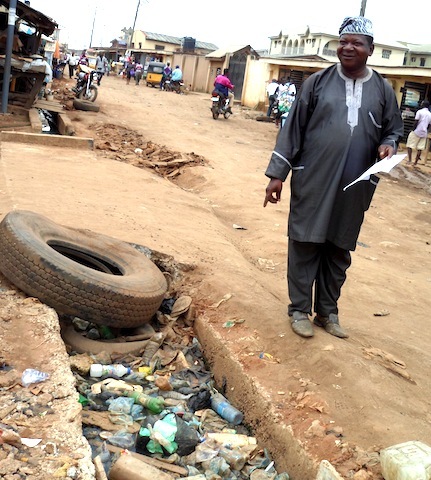 Chairman of Onilewura Landlords and Residents Association, Mr. Olusola Oseni, points to a broken culvert filled with debris, which caved in under pressure from heavy-duty trucks. In the CDA’s account books, the community has expended N953,000 on road rehabilitation alone in 2013. To carry out the palliative measures, residents were taxed with a monthly levy of N200, N100 for shop owners and N50 for one-room occupants. “We had to go to Ladipo where they were peeling asphalt to source for materials to fill up the roads, but to our dismay, MTN came to begin defacing the roads again on the excuse that they have sought permission from government to lay optic cables. They just dig the road and abandoned it. Another community leader, Henry Nwosisi, said the influx of church members posed huge security risk to the community, as so many strange faces are loitering around the area. “We don’t know who is who. A lot of phones and bags have been snatched from people in this area and they hide under the cover of the crowd. “Apart from the church’s immediate environment, there is no much concern for the welfare of the community. It is giving us sleepless nights that the church and the companies are not socially responsible to the community. We have done a great deal of appealing to our youths to maintain peace, if left for them, they know what to do to get what they want. “The community cannot spend millions to put the roads in shape without Joshua’s contribution only for his members to park their cars in every available space on Sundays. That would raise some negative sentiments and feeling towards the church and its members,” Nwosisi noted. Attempts to get the church’s response were stalled by the church’s protocol personnel, who stood firmly in the way of The Guardian. None of the church’s workers was willing to speak on behalf of the founder, while access to Joshua was bluntly rebuffed. 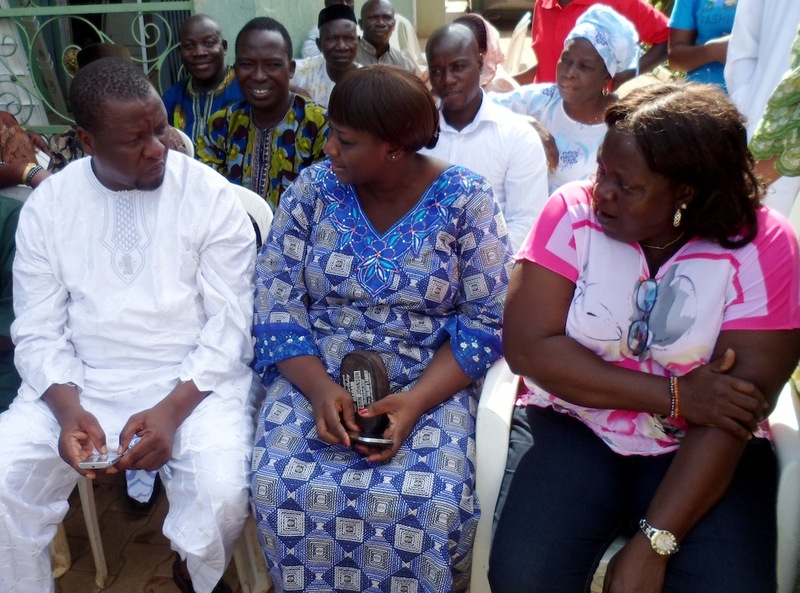 THE Chairman of Ejigbo Local Council Development Area (LCDA), Kehinde Bamigbetan, was yesterday full of thanks to God and appreciation to friends and associates who supported the family with prayers before he was released Saturday night. To the utmost shock of his family, he walked home unaccompanied and unhurt around 9:30pm after earlier reports of his release on Saturday morning, which turned out to be false, had heightened fears of a mishap in the release of Bamigbetan. 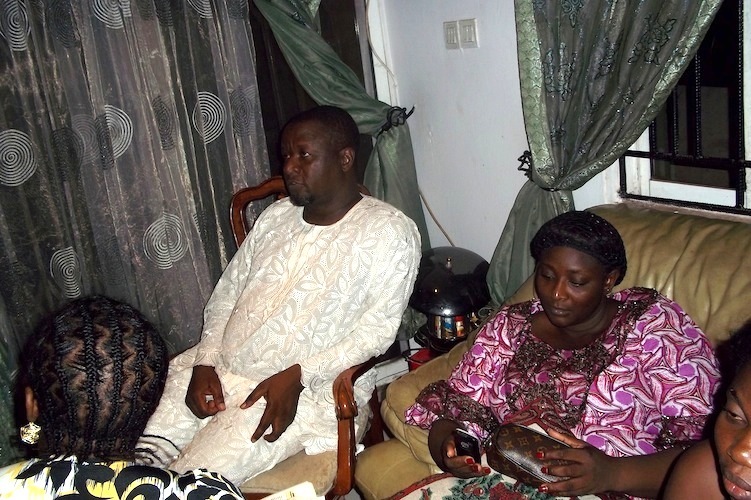 But all doubts ended when Bamigbetan stepped into his living room to be received by a bewildered gathering, which were deep in prayers for his safe return. Looking slightly emaciated and still dressed in the white lace he wore on the day he was abducted, he rushed forward to hug his wife, shook hands with family members and breezed into a room with just one mission on his mind: check on his children, who had been locked away from the throng of visitors. When he was about to be released by his captors, according to him, they asked if he could drive, and he replied in the affirmative. They took him out, blindfolded and drove him for four hours before he was dropped at the Badagry checkpoint, where a car was provided and he drove himself home. He breathed his first air of freedom at exactly 9pm when he took control of a manual saloon car, singing “Great Is Thy Faithfulness” to himself as he drove home. He was instructed to park the car beside the bridge close to his house and trek home. After being reunited with his family and enjoying a special moment of privacy, he stepped outside into the night devoid of moonlight and took the moment to relive his experience of the last five days, which to him, looked like five weeks. 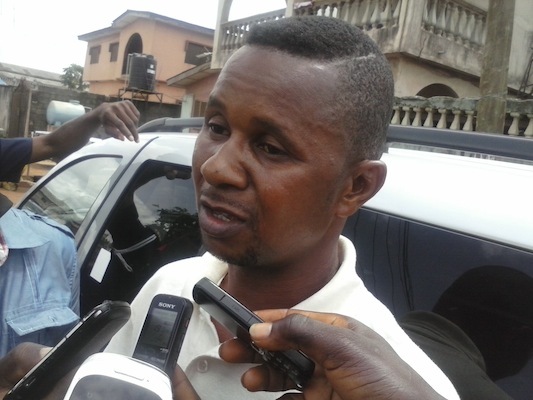 Strangely, on the morning he was abducted, Bamigbetan had experienced a strange feeling he could not explain and had almost cancelled his engagements for the day, but his vacillation cost him dearly. According to an inside source, the council boss is usually tidy about his Mondays. On such days, he is always out before 9am and dressed in suit. So, they suspected something was amiss when they saw the chairman strolling around the premises at midday. His wife, Fatima, sat speechless, absorbing all the narration. Intermittently, she would wave to the clouds, at other times, she would sigh and let out a loud moan or simply nodded along. “I thank everybody, I thank God he is back. Now, I believe in the power of prayers. I didn’t expect that to ever happen to anybody in Lagos. So, when it happened, we couldn’t do any other thing than to resort to prayers. Friends, political associates, neighbours and well wishers came and offered prayers and fasting, we were holding vigil everyday,” she said. 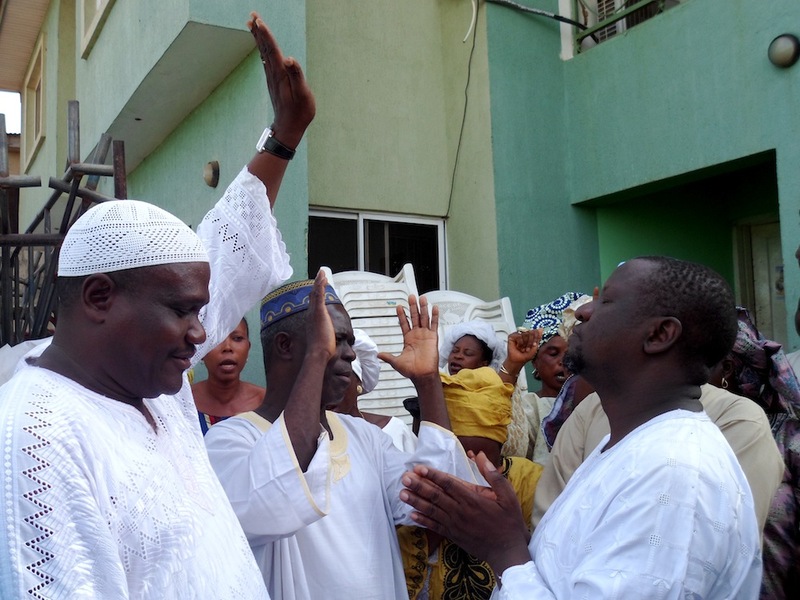 KEHINDE BAMIGBETAN (Right) OFFERING PRAYERS OF THANKS TO GOD FOR HIS RELEASE ON SUNDAY. And he has every reason to be troubled, as a politician and a serving council chairman, his abductors told him when 2015 elections come, they will be doing their elections with guns. “They told me they didn’t like what they were doing but they are graduates with no jobs. Looking slightly emaciated with body injuries on his face and arms healing, he said the way out of the present quagmire is for government to grant special status to Lagos to address its growing needs. “Lagos is the melting pot of Nigeria. This is where everybody comes to hoping to make it. That is why the federal government cannot continue to ignore Lagos. They must grant special status to Lagos. That is the way we can address the issue of massive graduate unemployment. “Graduates from every states are coming to Lagos to seek employment. As the commercial hub of the country, there should be massive provision of jobs. Without more money coming to the state to provide jobs, we cannot escape this trend of kidnapping. Everybody is at risk; they have gone beyond car snatching to kidnapping. “And as we move into the election year in 2015, they hear of billions being spent on frivolities, they see the crazy budgets voted for projects disappear into private pockets and they have decided to take up arms against the state and its citizens. PDP government has exposed all of us to danger; this is why we are insisting we should try another party like the All Progressives Congress (APC). “The solution is very clear, engage youth employment and provide more money for Lagos to address these issues. The governor is trying his best, but without massive resources to tackle the problem of unemployment, crime would always be an issue in this state,” he said. 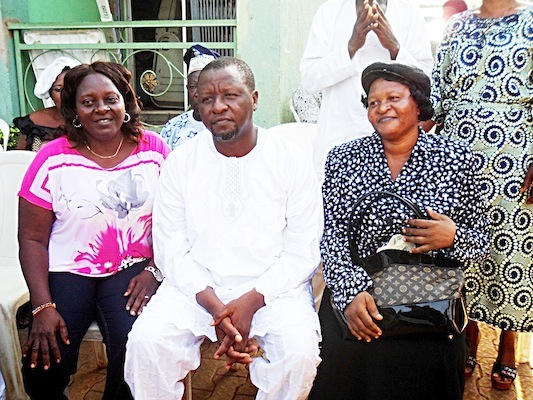 Bamigbetan, still dressed in the white lace he wore last week Monday when he was abducted close to his house, attributed his release to God and the prayers of friends and well-wishers. On the night he was released, he was driven blindfolded for over four hours before he was dropped at Badagry checkpoint. “When I was to be released, they asked if I could drive, I said yes. They said because everybody is looking for them, I have to drive myself home. They took me to a point and dropped me close to the border checkpoint at Badagry where a manual car was provided for me and the blindfold was removed. 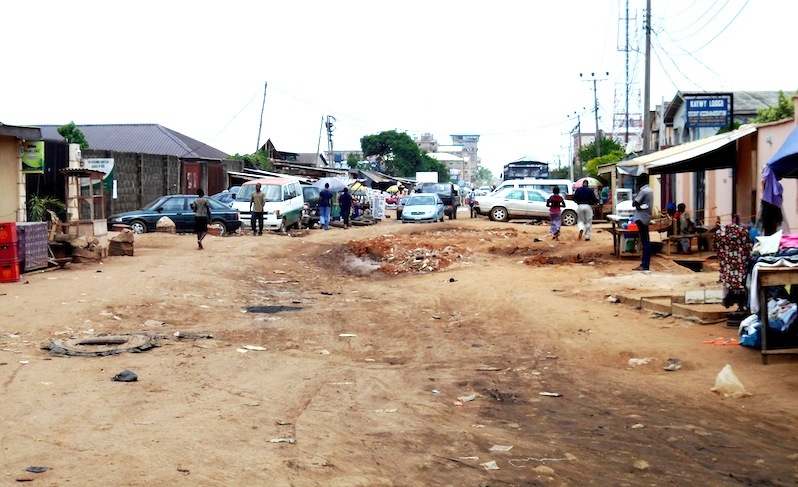 THE middle-aged driver of Chairman of Ejigbo Local Council Development Authority (LCDA), Kehinde Bamigbetan, who was kidnapped on Monday night, Abiodun Olayiwola, said those who kidnapped his boss at about 11pm, were patiently waiting for his arrival at the junction to his street on Ona Iwa Mimo Street, Ori-Oke, Ejigbo. He was with his driver in his black Ford Everest Jeep with special registration number KOK, without any police orderly, as the chairman was never known to use police escorts since assumption into office. The suspected kidnappers made contact with the wife of the chairman, Fatima, a few hours after he was abducted, demanding $1 million dollars. 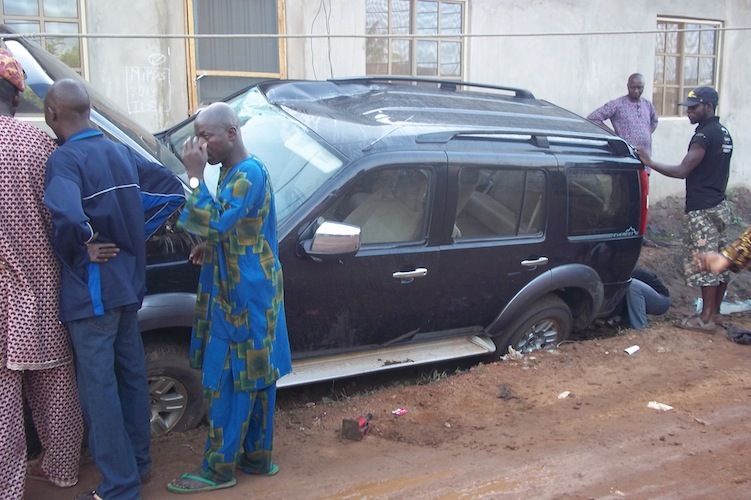 According to the driver, who sustained minor injuries, the gunmen released several gunshots into the air to scare away residents before catching up with Bamigbetan. “Even when we arrived Ona Iwa Mimo Street, there was no vehicle tailing us. Just a few metres to the chairman’s house, I saw a black saloon car, which I slowed down for and before I could know what was happening, the vehicle double-crossed me and they opened their doors and headed towards us. 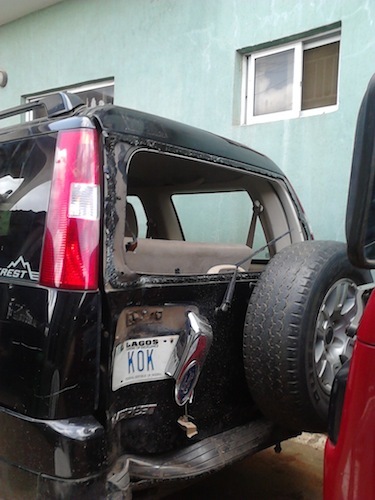 “A bullet entered through the bonnet to break the engine cover. It was at that point I ran out of the car into the darkness thinking the chairman would follow me. I left the car running just in case they were robbers, so they can make away with the vehicle. “It was when I returned that I discovered my boss had been captured. They took his phone and laptop. It was only his shoes I saw on the floor. Throughout they never said a word, so I couldn’t know if they were Yorubas or Igbos,” he added. The driver, fondly called Abbey, had been driving Bamigbetan since 2007. The council chairman had on Monday evening visited Bungalow in Jakande Estate for his ongoing tour of Community Development Associations (CDAs) before making a quick stopover at the secretariat. He eventually left his office around 8pm to head for Victoria Island. According to the young man in his 30s, who has since been detained at the Ejigbo police station, he was released at the spot by his captors after his family members paid a ransom of N500,000. AT the twilight of the sixth session of the National Assembly, Patrick Obahiagbon (who represented Oredo Federal Constituency on the platform of the Peoples Democratic Party, PDP) switched platform in a bid to ensure his political survival. 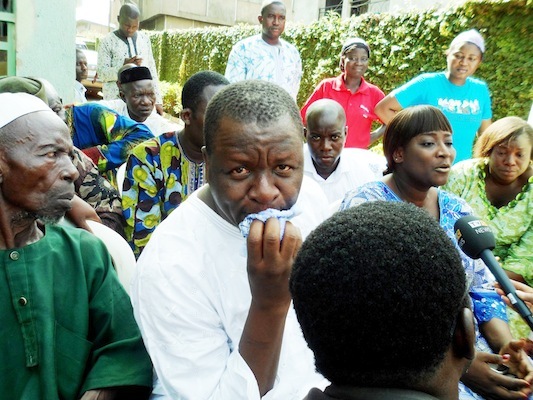 He moved over to the Action Congress of Nigeria, ACN, in Edo State. It would appear, overall, a good move, but within the ACN enclave, he lost the bid for party nomination to a combination and conspiracy of factors. The import of this “short-circuiting” was that Obahiagbon, the master of bombast, the sartorially elegant ambassador of the Bini culture (the royal Bini regalia), which was why he was always dressed in the attire, bowed out of the House of Representatives when his followers were just beginning to enjoy his interventions on the floor during debates. That marked the terminus of the verbal razzmatazz of the profoundly eventful gladiator. The House has since been missing Obahiagbon and his Obahiagbonese (his own peculiar coinages). But while he was in the Lower Chamber, Obahiagbon defined a unique character for himself, using the instrumentality of his swanky outfits as well as esoteric grammar (his peculiar manner of speaking). This is the uniqueness of Obahiagbon, the self-styled “son of Igodomigodo”, a sobriquet he has adopted since 1999, when he was elected into the Edo State House of Assembly. Obahiagbon had become a phenomenon in the House of Representatives. He could titillate to no end with his fecundity, coupled with the razzmatazz that accompanied his submissions. Answering a question on his forceful contributions on the floor, he had said: “…You cannot succeed as a parliamentarian if you are not cosmopolitan. You must be prepared to immerse yourself in societal dialectics for you to be able to contribute efficaciously in a utilitarian modus. So, if you are a parliamentarian and you don’t go through the ritual of even reading newspapers, you don’t bathe yourself in the aqua of the political cross currents, then you are going to be deuced, you are going to be paralytic in your contributions…”. On the achievement of the House of Representatives, Obahiagbon had once said: “…The House of Representatives has not fallen short of its vivacious commitment in acting as the moral policeman over agencies of government. We have taken our oversight functions very responsively and responsibly. The emotional, visceral commitments, the messianic zeal and the quixotic temper with which we have taken our oversight responsibilities had, to a large extent, assisted in cleansing the Augean Stable while a number of structural deficiencies have, through this parliamentary metamorphosis, been brought under focus…”. Yes, there are so many other instances when this self-acclaimed verbal contortionist mesmerized his audience, which space cannot permit me to recall; even as the current Chief of Staff to the Governor of Edo State, Obahiagbon has, within the scope of his mandate, been speaking in his trademark “language” and dazzling all and sundry as usual, including yours sincerely. Is there, therefore, any other way that is better than this tribute to celebrate Obahiagbon, one of those who were born in 1960, on his birthday (April 12), the day (April 12) I married my heart-throb, Pat, in 1997? Happy birthday, my brother, and many happy returns! Until lately, Lagosians were not known to spend festivals and public holidays indoors. Such days, which are far in between on the social calendar, are unique moments when families go out to experience fun on a full scale. No wonder then the nation’s commercial capital has always been reputed for high-flying celebrations, which had earned it the sobriquet, Eko for show. On a day like today, Easter Sunday, residents are usually spoilt for choice with places to visit and be thoroughly pleasured. But social re-engineering, security concerns, economic distress and horrid living conditions, which have all combined to make living in Lagos as stressful as living in a war zone, have made such choices limited to church events, the beach, Silverbird galleria, and the National Theatre Iganmu. 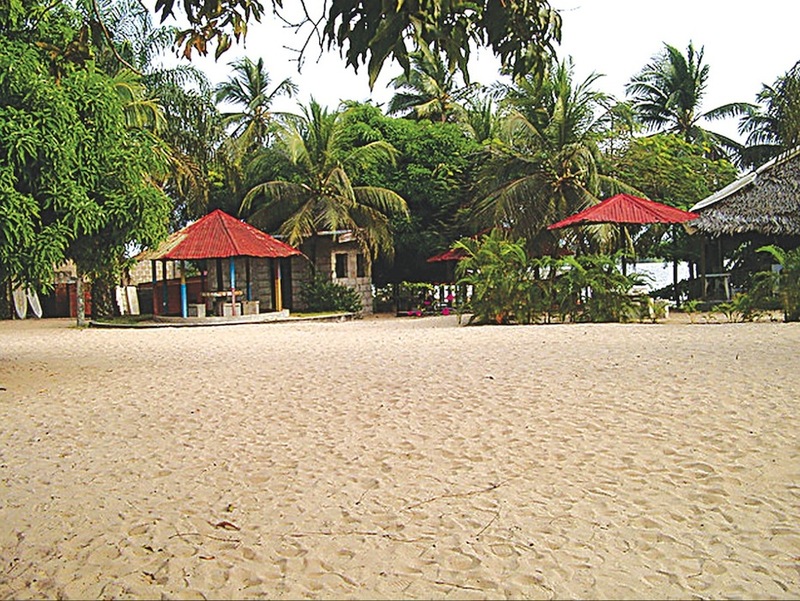 One of the few places that have over the years retained its tourism essence in spite of the infrastructural and social makeover of Lagos is the Whispering Palms Resort, a leisure and retreat resort for tourists and researchers at Badagry. Tucked away on an expansive land overlooking the lagoon in the border town of Badagry, the resort is an ideal environment to escape from the city stress, unwind, relax and reflect. Replete with the wonders of nature, such as a mini zoo, various sculptures, Oduduwa fountain, thatch huts, heritage museum of slavery and terraced lagoon front with concrete tables and seats, it is a unique spot for those who want to stand and stare, reflect and write or simply spend idle time for recreation purposefully. 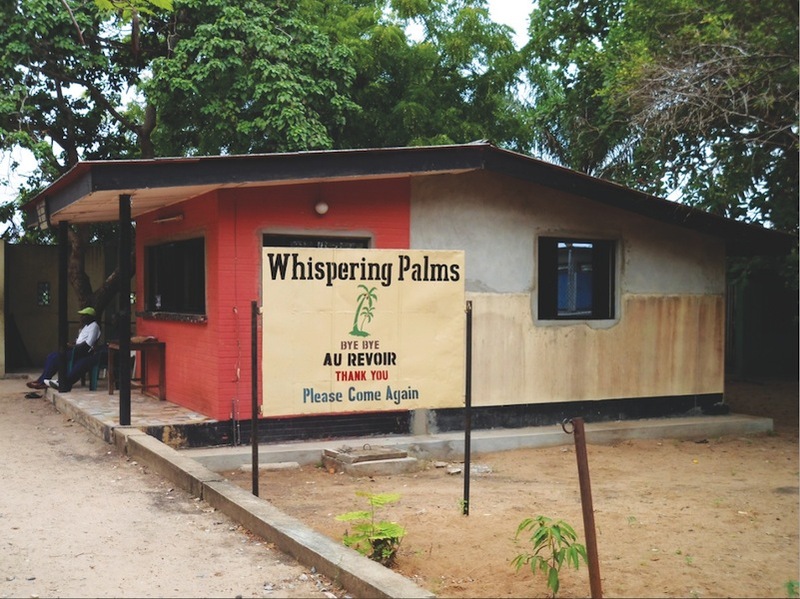 Chairman of Whispering Palms, Prof. Deji Femi-Pearse, had in the 70s visited Benin Republic and Togo each months for three nights to unwind and reflect on his research data, particularly in Tropicana Hotel, Lome, a German resort by the Atlantic Ocean shore, where some of his best scientific papers were written and published in peer-reviewed journals. Later, it became increasingly difficult to travel because of the growing nuisance on the road – police checkpoints, immigration, customs and plant quarantine, especially when the journey, which should normally take four hours took over 11 hours from Lagos to Lome. This emboldened Femi-Pearse to establish a resort of sort on the Nigerian coast. He, at first, procured a piece of land at Ojo, near Alaba market, but in a few years, it was encircled by heavy human habitation, noise and garbage. He eventually acquired the present location in 1981, which has since grown to become a soar-away success. On offer for the Easter Extravaganza is a Whispering Palms cultural festival where guests would be treated to a potpourri of local flavours featuring dances in Sato, Zangbeto, Igunuko, Egungun, Agbe, Akere, Gelede and a tortoise parade. Easter Monday offers more with adult dance competition, children dance competition, yam pounding competition, tug of war and Whispering Palms marching band. Sadly, these interesting scenes that could keep the mind fully engaged away from the burden of daily routine, would be sorely missed by a lot of would-be visitors, mainly because of the tortuous journey to the site. On this, the resort’s receptionist, Miss Clement Margaret, reads her chairman’s mind succinctly: “Our major challenge is the bad road, which has affected the business adversely. It is hell getting here from central Lagos, especially with the traffic from Mile 2 to Agbara. 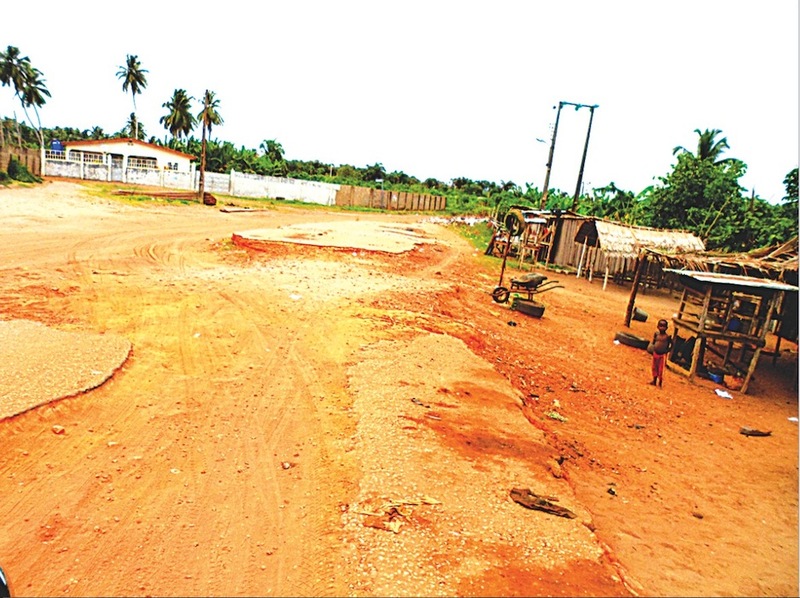 IWORO is a sleepy community in Olorunda Local Council Development Area (LCDA) on the outskirts of Badagry. Despite its location, it has become a popular place and a Mecca of sort to picnickers due to the presence of Whispering Palms. Despite the rich historical and cultural heritage that it represents, Iworo suffers from abject neglect and there is little to show that the community is under the management of Lagos State. Both the LCDA and the state government would be scored low going by the state of infrastructure available to the people. Besides the sorry state of the road, there is no electricity, potable water and security in Iworo. The road is dilapidated, causing endless pain and agony to users. Market women, commercial bus drivers and private car owners plying the route are constantly groaning under stress and untold hardship caused by the degenerating roads. A journey through the route is a risky venture, especially for visitors. Between Aradagun and Iworo, which shouldn’t take less than 10 minutes, motorists may sometimes spend up to two hours or more, as only a few motorists dare to navigate the area due to its swampy nature. 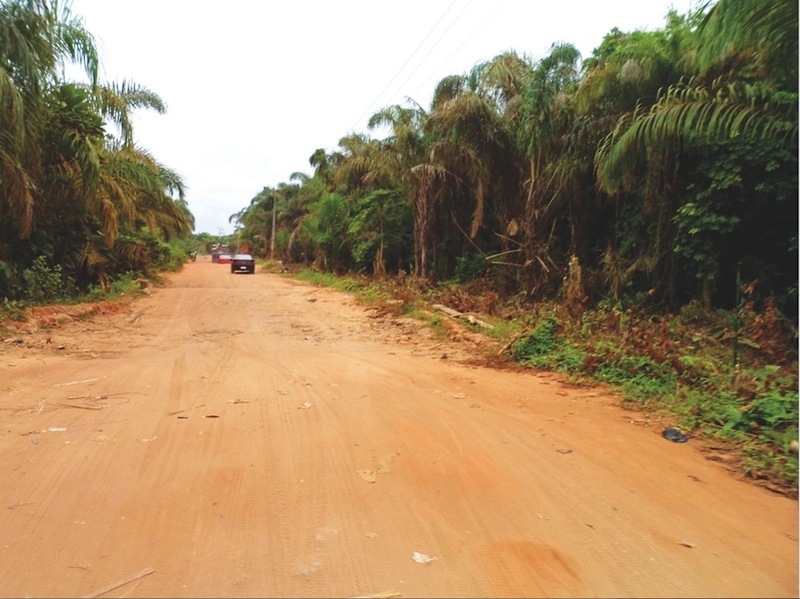 Unfortunately, this dilapidated road is the link to Ajido, Epeme, Mogoh and other communities. The Guardian gathered that during the rainy season, car owners ignore the area due to the damage caused to their vehicles. The few that dare ply the route charge exorbitant prices to the discomfort of residents. Despite the self-help efforts of Whispering Palms’ management and the community by filling some of the roads with rough gravel as a palliative measure, it gets worse every year. Hopes have, however, brightened of a lasting solution with the mobilization of Chinese construction company, CCECC to the area to commence rehabilitation works. The Guardian spotted CCECC already clearing a bush path to mount its onsite workstation, while earthmoving equipment have been moved to site. The challenge of bad roads and epileptic power supply notwithstanding, the relationship of the resort owners with the host community has helped to grow a dream into stability. “The community is proud to have this resort in their village and our guest have never for once had problem with the villagers. “We won’t have recorded this huge success without their cooperation because they can decide to upset the resort by posing as security threat and nuisance to our guests with their festivals, but such has never been the case,” Margaret noted. LAST week, the ancient town was the centre of attraction when the Lagos Black Heritage Festival opened up the people of Badagry to the huge potential in tourism located in their doorsteps, which had long been ignored by the state government. Apart from the misery of bad roads, construction of facilities that would facilitate patronage of tourists is still in limbo. 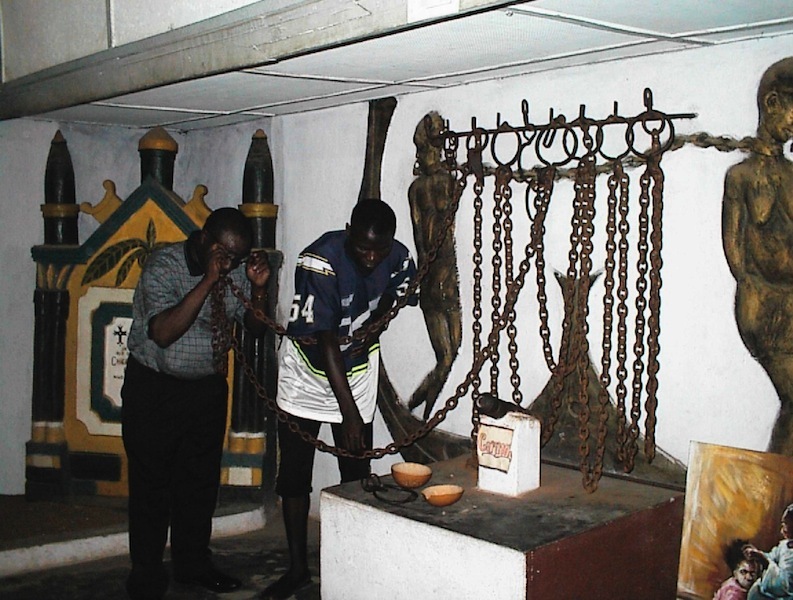 From the world-class golf course along the Marine Beach to Vlekete Slave Market, where slaves were sold during the period of the infamous slave trade, to the Slave Tunnels and other landmark slave trade relics, Lagos is yet to deliver to enhance tourism. Badagry has, therefore, remained a rustic community and is perhaps the poorest among its sister towns with heavy slave trade on the West Africa coast. But in spite of these setbacks, the locals are upbeat about the cultural resource at their disposal.